ABonAir’s Teleprompter and Video Return system is NAB 2019 nominee for the Product of The Year Award! From April 8 to 11, at booth C-2146, located at the Central Hall of the Las Vegas Convention Center, ABonAir will unveil the FIRST EVER integrated and WIRELESS Teleprompter and Video Return system. 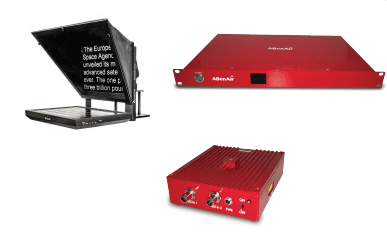 ABonAir’s complete wireless video solution offers a single link that incorporates teleprompter, video return, CCU and Intercom. We are looking forward to seeing you at NAB!